Input text: The ground is food. Camera light is black. A scarlet light is behind and above a huge shiny [abstract] pyramid. The sun is black. A blue light is 200 feet right of the light. The pyramid is on an enormous river. The river is facing southeast. The pyramid is facing east. 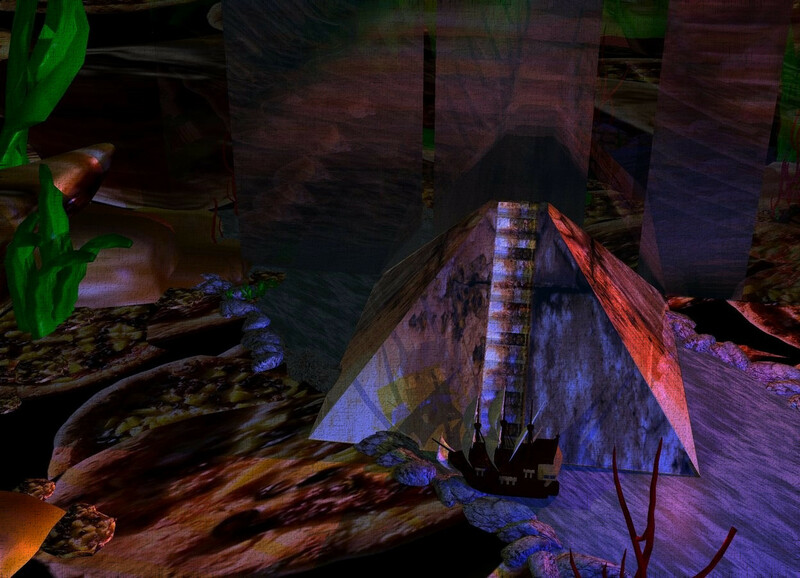 A ship is 10 feet east of the pyramid. A dim light is 200 feet right of and 100 feet behind the blue light. A humongous flat clear wall is west of the pyramid. It is facing east. A dim yellow light is east of and above the ship. very atmospheric and a great scene!